Don’t wait until an accident or OSHA knocks on your door to decide to put proper safety precautions in place! With Cleasby safety equipment the job just got a lot easier. 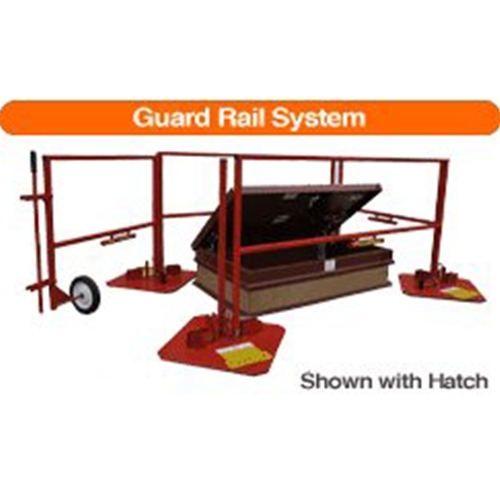 Put together your full fall prevention barrier system with 8 foot guard rail sections as well as additional components – All conveniently here at the Intech Equipment and Supply online store. The full barrier system by Cleasby includes available 5, 8 and 10 foot guard rail sections, as well as base plates. When properly assembled, this barrier system can support and prevent falls for up to 200 pounds of deadweight. Easy to set up and easy to order, this is a great addition to your PPE line up. The 8 foot guard rail can be paired with 5 or 10 foot pieces to customize your barrier system. All components are ordered separately, so you simply get only what you need. Cleasby also has the S00064 Transport Cart, designed to move the base plates around the roof top as the working space progresses during the job. Assembly is fast, typically taking a few minutes – and all necessary hardware is provided. Added reinforcements are also built into to this fall prevention system, included OSHA specified brackets for holding 2 inch by 6 inch toe boards. The guard rail sections get pinned to the base plate for added security, and the base plates themselves have a reinforced hoisting eye for transport. Browse the full Cleasby line up for roofing equipment, hand tools, safety equipment and more! Cleasby is a trusted provider for over 60 years in the roofing industry. All aspects of this barrier system are available for separate purchase, so choose the exact lengths you need to meet your current job site demands. Order online or call our pros for additional information as well as any product questions you may have.